Mister Cassowary is a fantastic children’s novel about a boy named Flynn and his dad visiting the farm where Flynn’s grandfather had a terrible accident and died. They’re trying to fix up the farm so it can be sold in two weeks. Flynn doesn’t know much about cassowaries (lots live around the farm) or why his dad is so scared of them. With the help of local girl Abby, Flynn tries to discover the mystery around his grandfather’s death, about his grandfather’s own cassowary — Big Blue — and why two baby cassowaries don’t seem to have a dad. Although I didn’t find the opening scenes intriguing, if you continue further in then you will find yourself staying up at night to find out more about the mystery of Grandad Barney. Throughout the book you learn more and more about cassowaries and how they are a beautiful and endangered species. At the end of the book it tells you more facts about cassowaries so you can deepen your understanding of those birds. This book is definitely worth reading for children aged 7+ — it does deal with some tough topics (like death, and facing your fears, and family relationships) in in easy-to-read novel. Joseph is one of our regular book reviewers. His most recent review (if you don’t count this one) was of Australian Kids Through the Years. If YOU would like to send us a book review, check out our submission guidelines. Happy reading! This book is set at Poppy’s house. When the doorbell rings and a car speeds away, her family discovers that a baby has been left on the doorstep. What will they do? Where are the baby’s parents? I really liked the creativity and the language in this book. I liked how it was about a situation that doesn’t happen every day. My favourite character was Mei because she was funny and cute. I was surprised when she turned up because I didn’t expect what was left on the doorstep to be her. This story is realistic and you feel like it could happen to you. What would you do if a baby turned up on your doorstep? I would recommend it for kids aged 7+ and people who wonder about these sorts of things. You can read a sample chapter of At My Door on the publisher’s website. And you can listen to the author read from the book, too. Matilda is one of our regular book reviewers. Her most recent review (if you don’t count this one) was of The Cleo Stories: A Friend and, A Pet. If YOU would like to send us a book review, check out our submission guidelines. Happy reading! This is another book by Meg McKinlay. I have also read Duck for a Day, Definitely No Ducks, and Ten Tiny Things. This is a novel with occasional pictures in black and white. Bella is a girl who lives in a house that seems to be moving at night and then stops at different places. It’s hard for her mum and dad to get to work every day from a different place. But then things really get out of hand when Bella finds out the movers will cut her house in half to move it back to where it belongs. A house that wanders around reminds me of Baby Yaga’s house with chicken legs from folktales. It was a very imaginative book. I wouldn’t like it if my house walked away at night. I recommend this book for ages 6 and up. Matilda is one of our regular book reviewers. Her most recent review (if you don’t count this one) was of Molly and Pim and the Millions of Stars. If YOU would like to send us a book review, check out our submission guidelines. Happy reading! I’ve watched the movie Nim’s Island and I saw this book in the library, so I borrowed it. Now I’ve read Nim at Sea, I will have to read Nim’s Island. In this book, Nim tells Alex in a really angry way that it would be better if she was off the island. So Alex goes. Jack still thinks Alex is on the island and Nim is going to get into really big trouble. Then Selkie (a sea lion friend) gets captured by the Troppo Tourists — can Nim get Selkie back? Can they all be together as a group again? I really like the bits when Fred (the marine iguana) sneezes and everyone says “Yuck, Fred!” and I like feeling inside the story and wanting to encourage Nim. Kids that like books with lots of adventure should read Nim at Sea. (So should kids who love Nim’s Island.) This book is great for kids aged 8+. 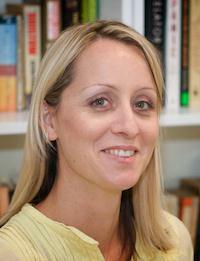 Matilda is one of our regular book reviewers. Her most recent review (if you don’t count this one) was of The Red Wheelbarrow. If YOU would like to send us a book review, check out our submission guidelines. Happy reading! Totally Twins is a new series for girls. 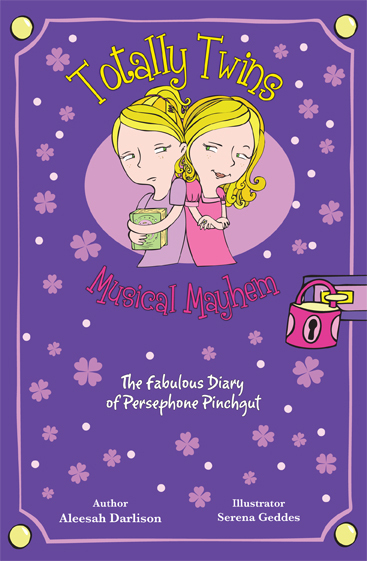 The first book in the series, Musical Mayhem, was released in September 2010. The author, Aleesah Darlison, is taking Musical Mayhem on a blog tour to celebrate the launch of the book, and she arranged for us to interview a character from the series—Portia. You can get to know Portia’s twin, Persephone, on another stop on the tour. But now, let’s meet Portia. Your twin sister, Persephone, keeps a diary. Do you keep a diary too? No. Not yet, but seeing Perse have so much fun with her diary sure makes me want one too! I’m usually kept pretty busy with school and ballet practice but maybe I’ll ask Mum to splurge on a new diary for me. I can’t let Perse have all the fun! What’s the best thing about having a twin sister? Having someone you can always, always rely on. What’s the worst thing about having a twin sister? Having to share a birthday—every year. But at least Mum lets us have our own cakes. Fun, friendly, fabulous, fashionable and … FUNKY! Perse is a sensible, sensitive, shy, serious and super sister! But don’t tell her I said that, it might go to her head. If you found $20 lying on the ground, how would you spend it? I’d buy some pink-iced cupcakes for Perse and me (chocolate for her, vanilla for me)—but don’t tell Mum because she’s dead against high sugar food. I’d also buy some new jewellery and magazines. Persephone (Portia’s twin sister) also has her own blog where you can send her messages and download Totally Twins material. Visit Perse at: http://totally-twins.blogspot.com.